Under Belgian colonial occupation (1908-1960), land was stolen from communities all along the length of the Congo River to establish oil palm plantations. Now, the communities have launched a determined effort to get their land back. But the company occupying their lands today is expanding its activities with funding from the world’s biggest development finance institutions and multilateral banks – despite these agencies’ stated commitments to support the rights of local people. A simmering, 100-year old land conflict in the wartorn Democratic Republic of the Congo (DRC) is about to boil over. Today these government-controlled institutions provide upwards of $100 billion to private companies operating in developing countries, which is equivalent to almost two thirds of official development assistance. A growing share of these funds are targeted at companies operating in the food and agriculture sector. Northern governments equipped their DFIs with codes and standards to guard against corruption and human rights violations in countries where they operate. These policies are meant to prevent DFIs from investing in companies that grab land, violate labour rights or engage in corrupt practices. The Belgians took all these lands without a single legal document. – Gaspard Bosenge-Akoko, member of the Orientale Provincial Parliament. So how did several of the world’s most prominent DFIs come to own Feronia Inc., a Canadian agribusiness company that people in the DRC say is illegally occupying their land, subjecting them to horrific work in plantations and leaving their communities destitute? There is also evidence that Feronia has engaged in financial practices that violate the anti-corruption policies of its DFI owners. Belgian oil palm plantation development was backed by King Leopold’s brutal colonial forces and financed by the Lever brothers. The brothers built up oil palm plantations near the villages of Lokutu and Yaligimba in Oriental Province and Boteka in Equateur Province. The plantations would eventually fuel a food processing empire and lay the foundations for the development of one of the world’s largest food corporations – Unilever. Unilever held onto its oil palm plantation business throughout the 20th century until 2002, when, with war raging in eastern Congo, it decided to pull out of the country. That year, it sold its consumer products subsidiary, Marsavco, to a Pakistani business family with deep roots in the DRC. 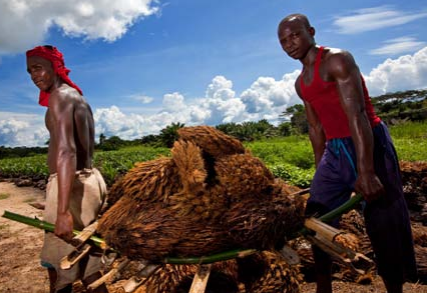 Then, in 2009, after several years of neglect, it sold its oil palm plantations in Boteka, Lokutu and Yaligimba to Feronia Inc., a little known company registered in the Cayman Islands with no previous experience in the palm oil sector. Unilever’s plantations were held through a Congolese company called Plantations et Huileries du Congo SARL (PHC) that was 24 percent owned by the DRC government. In 2009, Feronia Inc acquired Unilever’s 76 percent share in PHC by paying $3,854,551 to a Unilever holding company in the Netherlands. The company’s directors then took Feronia Inc public on the Toronto Stock Exchange in 2010 in order to finance its continued operations. Over the next few years, Feronia racked up tens of millions of dollars in losses and its stock price tanked, from around $4 when it opened in September 2010 to less than a dollar by November 2013. The company would likely have collapsed completely had it not been for a startling rescue by several major multilateral banks and development finance institutes. The AAF has DFI investment from France, US, and Spain as well as the African Development Bank and several other African multilateral banks. The Alliance for a Green Revolution in Africa (AGRA) is listed as a “promoter” of the fund, while the European Commission and the Italian Cooperation Agency finance the AAF’s Technical Assistance Facility. The AAF made further equity investments in Feronia in March and November 2013 totalling $14.5 million, this time through its Mauritius-based subsidiary Golden Oil Holdings Limited. By the end of 2013, AAF’s subsidiaries controlled 32.5% percent of Feronia. The other major DFI investor in Feronia is the UK government’s CDC Group plc, formerly the Commonwealth Development Corporation. The CDC made its first investment in Feronia in November 2013, spending $14.5 million to take 27.5 percent of Feronia’s shares and providing the company with an additional $3.6m convertible loan facility to support the implementation of an Environmental and Social Action Plan. Then, in January 2015, it invested $7 million to take its ownership of Feronia up to 48 percent. 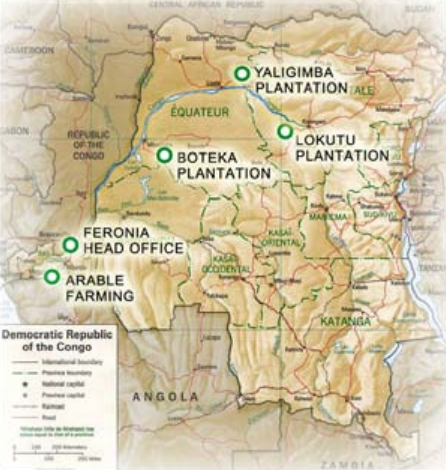 Today, the AAF and the CDC control over 70 percent of Feronia’s shares, while the DRC government retains its 24% stake in PHC, Feronia’s DRC oil palm plantations subsidiary. The Réseau d’information et d’Appui aux ONG nationales (RIAO-RDC) is a network of 256 non-governmental organisations and 333 peasant associations across all provinces of the Democratic Republic of Congo. GRAIN is a small international non-profit organisation that works to support small farmers and social movements in their struggles for community-controlled and biodiversity-based food systems. This report was produced by GRAIN and RIAO-RDC in collaboration with Association Française d’Amitié et de Solidarité avec les Peuples d’Afrique (AFASPA), CIDSE, Food First, SOS FAIM, Mundubat, War on Want, and World Rainforest Movement.